The Fair Labor Association, a workers' rights watchdog group, was hired by Apple to inspect its Foxconn operation—under a considerable amount of flak recently. So what'd they find? Illegal working hours, legal pay, crooked unions, and danger. Even though Apple paid for the study, the findings—which tapped over 35,000 anonymous Foxconn employees over the course of 3,000 hours—are independent and sufficiently damning. There are two issues here – the FLA Code Standard of 60 hours per week in total (regular plus overtime) and the Chinese legal limits of 40 hours per week and a maximum of 36 hours overtime per month (effectively nine hours per week). All three factories exceeded the FLA Code Standard and the requirements of the Chinese labor law at some point in the last 12 months. During peak production periods, the average number of hours worked per week exceeded the FLA Code Standard of 60 hours. Also, there were periods in which some workers did not get one day off in seven days. But many workers are OK with that! This probably says more about the dire agrarian subsistence hells these people came from, rather than their current quality of life at Foxconn. 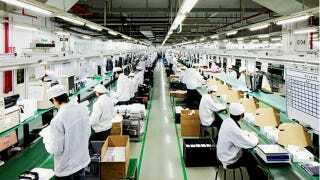 The average age of a foxconn worker is 23. The...assessors found that wages are paid on time and are above the applicable legal rates. The legal minimum wage in Shenzhen is RMB1500, while the starting wage at Foxconn is RMB1800. After the probation period, wages go up to about RMB2200. Sick leave payments are higher than the local law requirement, with workers compensated 70% as opposed to the minimum law requirement of 60%. Overtime hours were also paid at the appropriate premiums. With respect to satisfaction with wages, 64.3% of workers thought that their salary was not sufficient to cover their basic needs. Not only is it grueling, but it's illegal and dangerous. The working hours of interns should not exceed eight hours per day, five days per week, and interns should never work seven days straight. Our assessors found that interns worked both overtime and night shifts, violations of the regulations governing internships. Foxconn provides interns with work-related injury and health insurance, and personal accident and liability insurance is provided by their schools. Under Chinese labor law, interns are not defined as employees and legally, no employment relationship exists between the factory and the interns. This means that the general protections of the labor law do not apply to interns, including the social security benefits that normal workers receive. While regulations applying to interns exist in Guangdong Province and the Ministry of Education has issued policy regarding interns, their employment status remains vague and represents a major risk. Workers had very limited knowledge of the structure, function and activities of the worker participation bodies within Foxconn. When we investigated the industrial relations system at Foxconn we found that even though a union exists, a large majority of workers seemed unaware of its activities and of the collective bargaining agreement. Which means the unions are just Foxconn unionized against itself, for the purpose of accomplishing nothing. The report can be read in its entirety below. Nothing shocking—mostly just the confirmation of what we've been reading and seeing for months, though it's certainly possible workers held back from fear of corporate retribution. But let's acknowledge this again: the people who build our iPads and iPhones aren't treated in a way we'd be okay with treating people here. Apple could do something about it—they hold the money—but they don't, or at least haven't. We'll see if that changes—Foxconn has already promised some reforms, but all that's forcing it at the moment is the force of its own words. The FLA's head honcho, Auret van Heerden, sure sounds confident: "I know they will [change] because we will monitor it. And they have made this commitment publicly now. It is such a high profile and major commitment, there is no way they wouldn't do it." This is the same man who, before ABC's cameras, said he fully expected Foxconn to put on a show for him and his inspection crew as they toured the plant. But given that Apple's stock is already down 7 points after hours today, maybe this will become a serious priority instead of a PR whitewash.